The Can Do Kids were helping the Seniors Club at the community center trim their tree as a picture of Santa looked down on them from its place of honor on the wall. There was lots of conversation and laughter as the seniors and the “Can Dos” worked together on the tree. After thy finished trimming the tree, the “Can Dos” and the seniors shared lunch together. The “Can Dos” all looked surprised and a bit worried. Was Santa sick? Wasn’t he coming this year? Grandma Hattie began to read. “Dear children,” wrote Mrs. Claus, “I need you help this Christmas. Your grandmas and mamas make such wonderful snacks for Santa, and he eats and loves them all. But…he is getting too heavy, and that is not good for him. Why last year, he got stuck in a chimney at one house, and the father of the house had to help him get unstuck!. Then he had a hard time dragging his bag of toys up the stairs in an apartment building. 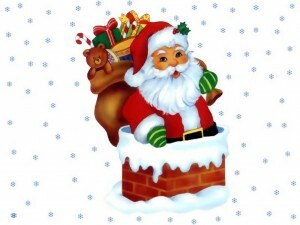 When Santa came home from his big night on Christmas Eve, he had popped two buttons on his pants. He had an upset stomach from all the snacks he ate as he made his way around the world dropping off gifts for children. I have had him on a healthy diet since last Christmas Eve. Santa has lost weight. Mind you he is still round and jolly looking, but he has lost weight. Here is where I need your help. Santa can’t say no to cookies, cakes, candy and the other treats your mamas and grandmas make for him, and you put out for him. I need you to put out less fattening, healthier snacks this year. Please ask your mamas and your grandmas to help you think of what snacks would be good for Santa. The room was quiet for a moment or two and then the Seniors and the “Can Dos” broke in fast conversation. What to fix for a Santa snack? After a few minutes, everyone agreed the following would make good Santa snacks…low fat milk, fruit, low fat yogurt, a handful of nuts, celery stuffed with peanut butter and carrot sticks. What can you think of boys and girls that would be healthy snacks for Santa? ?